he 7001L Interactive Digital Signage display combines an optical multi-touch touchscreen with a professional-grade, large format display in a slim, integrated package. For retail, hospitality, commercial real estate, education and other commercial applications, the large wide-screen format offers a high-quality, interactive canvas for attracting and engaging consumers. The 7001L offers system integrators and value-added resellers (VARs) a high performance solution that is easy to deploy and maintain. With a total thickness of 3.5 inches (89 mm), the 7001L is compliant with the ADA requirement of less than 4" protrusion for wallmounted products when used with a compatible wall-mount. With a 700 nit LED panel, the 7001L is a bright, high quality display suitable for public environments. 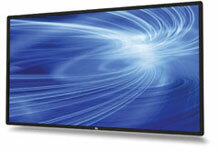 The optical touchscreen enables up to six simultaneous touches for multi-user interaction. This touch technology offers a fast and extremely sensitive response similar to the experience on mobile devices and is compatible with Microsoft Windows 7 and Windows 8 operating systems. The touchscreen is 4 mm thick, fully tempered glass. Optional, high performance computer modules are available which turn the 7001L into a completely integrated all-in-one computer""without the need for any cables or additional mounting hardware. Computer modules are available in a choice of two models: ECMG2-i3 based on a 3.3GHz Intel Core i3 processor and HD2500 graphics ECMG2-i5 based on a 3.6GHz Intel Core i5 processor and HD4000 graphics. The high performance, commercial-grade computer modules make the 7001L a reliable platform that is interoperable with most content management servers and supports optimal partitioning of locally cached and network streamed content. The Elo E027378 is also known as Elo Touch Systems	ELO-E027378	.